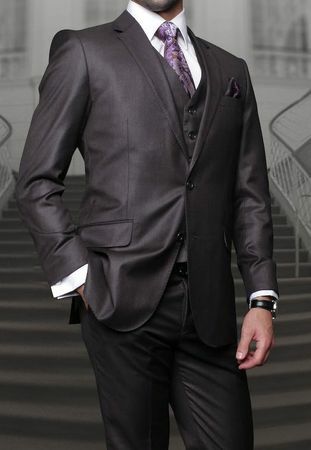 It takes the modern man to properly wear a modern fit suit and this charcoal color 3 piece modern style fit suit has just what you're looking for. From flat front pants to pick stitch detail on the jacket, this is a fine wool suit that you can serious look your best wearing. The jacket has double vents and the vest makes it a bonus as well for a great suit to wear to work or that trendy bar downtown. Made of fine super 150s wool.